Carmex was always the first choice in lip balms back in the '80's when I was in middle school. It was soothing to the lips and had a medicinal quality that was comforting. My lips are extremely dry so I go through lip balm like crazy. If I am not wearing lipstick, I am wearing lip balm and chances are I am wearing lip balm under my lipstick too! 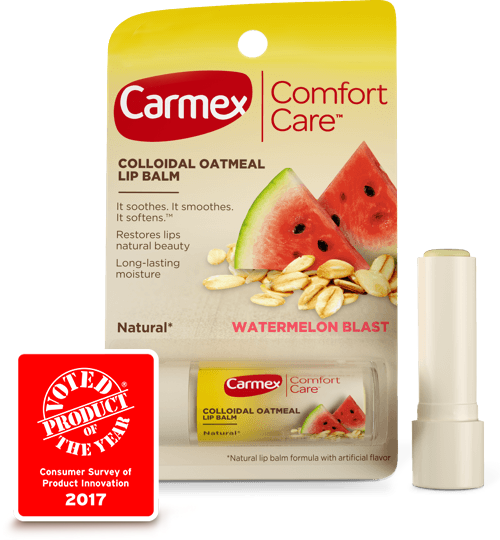 Recently I received these new Carmex Comfort Care Colloidal Oatmeal Lip Balms to try out. I was so excited to try them, first because they are from Carmex and second because I love lip balm. 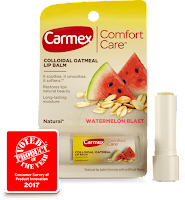 What is so great is that these won a 2017 Product of the Year from the Consumer Survey of Product Innovation (in the Lip Care Category and a survery of 40,000 people). They come in three flavors: Sugar Plum, Mixed Berry and Watermelon Blast. They can be found in a 1 pack or a 2 pack product. I received the 1 pack. When looking for prices I found them for the 2-pack and they are very reasonable. 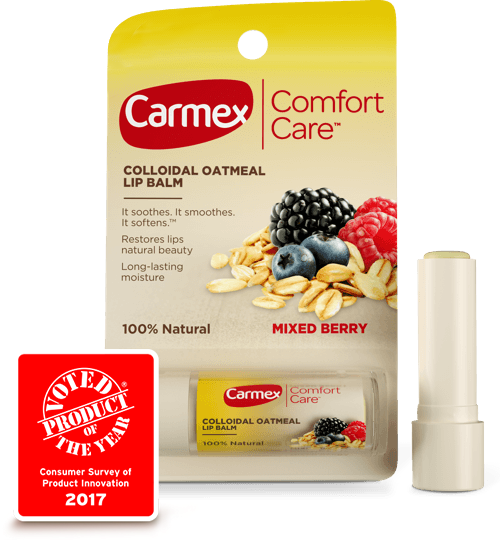 These 100% natural lip balms contain colloidal oatmeal to comfort the lips and cold-pressed anti-oxidant rich fruit seed oil provides long-lasting moisture to help restore healthier, naturally more beautiful, visibly smoother lips. They are petrolatum-free and paraben-free. The lip balms are fairly thick and last a long time on the lips, so you don't have to reapply every few minutes and that is the main goal here. You want something that is going to last a while. My favorite one is the Sugar Plum. I also really like Mixed Berry. Watermelon Blast I am going to leave for summer, as it is really tastes and smells just like a watermelon, which reminds me of summer. I like these because they are so thick and waxy, they will stay on the lips and do not come off as easily as other lip balms do. I am extremely happy with these lip balms. On the website there coupons you can print for $0.45 off of a Carmex Comfort Care Lip Balm. 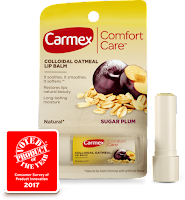 On the Carmex website there is a portion of the site called Everyday Lip Care and discusses how to take care of your lips. It has sections such as, "What are healthy lips?" "What can I do for dry chapped lips?" "How can I protect my lips from sun damage?" That last one is very important because lips are very susceptible to sun damage, as the skin on the lips is very thin and when out in the sun lip balm should have a sunscreen. Lips can get sunburn and even skin cancer. Read this section, it is very informative. 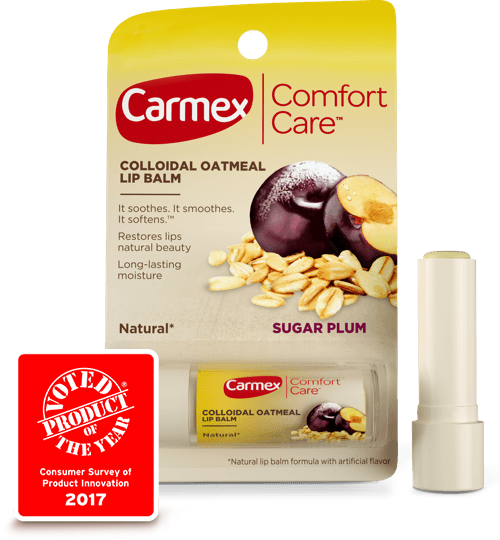 Carmex Comfort Care Colloidal Oatmeal Lip Balm retails for around $2.50 per 2 pack and is available at many stores including Target, Walgreens, CVS, Kroger, ShopRite, Meijer, and Walmart to name a few of the stores that carry the product. Like Carmex on Facebook: https://www.facebook.com/carmexlipbalm; Follow Carmex on Twitter:@carmex; Follow Carmex on Instagram:https://www.instagram.com/mycarmex/ and Subscribe to Carmex on YouTube:https://www.youtube.com/channel/UCH9t4jcy4U4ydhdeJhpJWNw.